Patients with a known, or who suspect they have, a metal allergy will find the following information on metal allergies, and particularly nickel sensitivity, useful in helping them to avoid nickel exposure and resulting allergic contact dermatitis (ACD). The metals that most commonly cause ACD are nickel, chrome and cobalt. In addition many other metals have occasionally been shown to cause ACD, although with a much lower incidence than the first three. Gold, palladium and platinum have been responsible for ACD from jewelry and sometimes industrial exposure. Many metals and metal salts are irritatimg to the skin, even in absence of ACD. Nickel is by far the most common metal allergen and is more often a problem in woman than in men. This is possibly related to the wearing of jewelry; especially pierced earrings. In nature, cobalt is frequently found along with nickel and therefore is frequently present in metal objects that contain nickel, either intentionally or accidentally. In addition, cobalt is commonly used in many other metal alloys and in clay and pottery. It may be present in manufacturing processes for paint, polyester resins, glass, pigments. In contrast, chromate (chrome) is not normally found in hard metal objects bust is found in the form of chromium salts which are present in cement, concrete, and similar construction materials. It is also used in tan leather goods. The incidence of metal allergy has increased over the years, especially among young females, as the desire to pierce their ears (and noses) has increased. Across females of all ages the wearing of jewelry is most common cause of nickel allergy. In men, occupational exposure seems to be a greater risk factor and as such the hands tend to be the more affected area. As more men pierce their ears an increase in nickel allergy has been seen among males. Nickel is hard, strong, silver-white metal that resists corrosion and is used for electroplating and making alloys. Principal exposure is through costume jewelry (usually the inexpensive type) and other metal objects. Nickel is also known as niccolum sulfuricum. The most classic presentation of metal allergy is jewelry dermatitis; among the types of jewelry, earings seem to be the greatest culprit. Presumably this is because the pieced earring actually penetrates the epidermal barrier, allowing potential exposure to tissue fluids at the time of piercing and again thereafter should trauma or infection occur. Some metal-sensitive individuals react only to earrings and are able to wear rings, necklaces, or other jewelry without difficulty. Wristwatch buckles and bands and eyeglass frames are also possible causes of metal jewelry dermatitis. Skin discoloration that sometimes takes place on the skin under jewelry (known as black dermographism) usually results from the reaction of sulphides and chlorides in perspiration with the gold alloy. This should not be mistaken for an allergic reaction. Symptoms may worsen during various seasons or times of increased perspiration. This occurs because sweat can cause leaching or dissolving out of metals. 9 Nickel plating for alloys such as new silver, Chinese silver and German silver. OCCUPATIONAL EXPOSURE Men have a greater frequency of sensitization to nickel at work than women. The most effective means of preventing nickel sensitization would be to reduce exposure to nickel from costume jewelry, particulary earrings, and other nickel containing materials. When purchasing earrings ask for stainless steel studs in order to avoid nickel. Also in occupational risk areas protective devices (gloves, etc.) Should be used. 3 Clear nail polish can be used to coat jewelry and clothing buttons. This should be repeated weekly to maintain barrier. 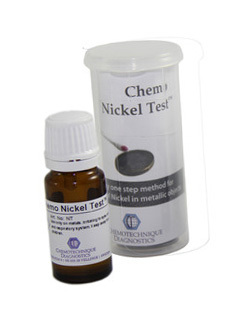 SELF-TESTING FOR NICKEL CONTENT IN METALS WITH: CHEMO-NICKEL TEST®, " THE ONE STEP TEST KIT"
CHEMO-NICKEL TEST®, " THE ONE STEP TEST KIT" is simple to use: Moisten the applicator with the solution and rub in a circular motion against the suspected object for 30-60 seconds. If the rubbed location on the item turns color (pink to reddish), it indicates a positive reaction and presence of nickel in a concentration of at least 1:10,000. If there is no color change, there is no nickel present. The test chemicals do not harm the tested items. As with all chemical based products in the household, KEEP IT OUT OF THE REACH OF CHILDREN AND STORE IT IN A COOL PLACE. Prior to subsequent use make certain that the product is not beyond the expiry date shown on the label. CHEMO-NICKEL TEST® is a trademark of Chemotechnique Diagnostics AB , Malmo, Sweden.